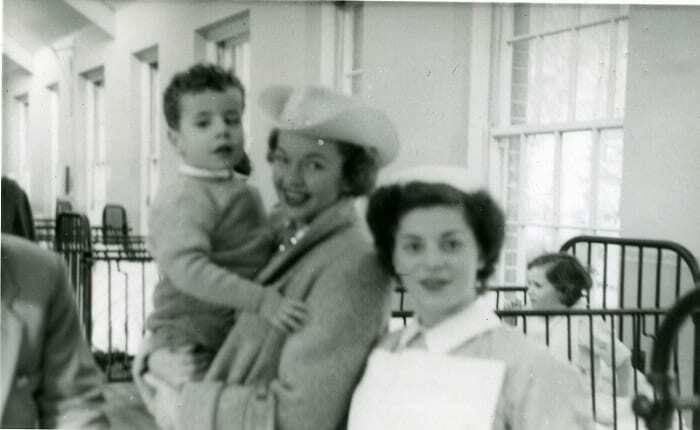 You may think that celebrity visits to hospital wards are a relatively new phenomenon but photographs from our fantastic Dr Alexander Dale collection document a number of visits from famous faces during the 1940s and 50s to the wards of Mearnskirk Hospital. Mearnskirk Hospital was opened in 1930 primarily for children with surgical tuberculosis, children with long-term orthopaedic conditions and those with infantile paralysis. Many of the patients would be in the hospital for very long spells and so it was extremely important to keep spirits high, particularly as visits from family and friends were restricted to only a couple of hours each week, sometimes less. To help keep the children entertained and brighten up the long days, the staff at Mearnskirk would often arrange special trips and treats for the patients including days out to the seaside or visits to the local cinema. Many children, however, were unable to leave the wards and so a visit from a famous face was always an exciting prospect and helped to bring a little magic and glamour to Mearnskirk. Movie star, Beatrice Campbell, best known for her roles in Last Holiday (1950), The Master of Ballantrae (1953) and The Mudlark (1950), visited Mearnskirk on the 5th November, 1948. We have several photographs of her visit where she is pictured chatting with staff and patients and enjoying afternoon tea. 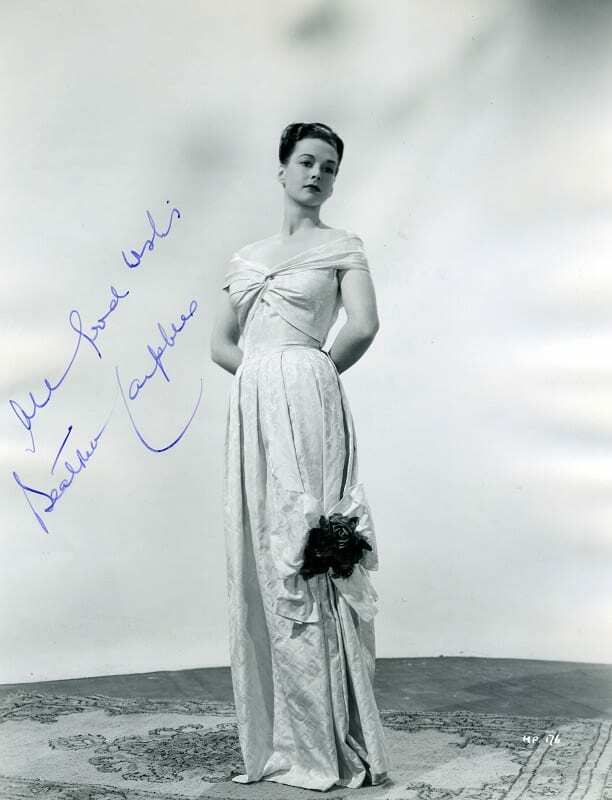 There are also some beautiful, signed studio of photographs of the actress. In our archive we also have a letter written on Beatrice’s behalf from Pathe Pictures Ltd. 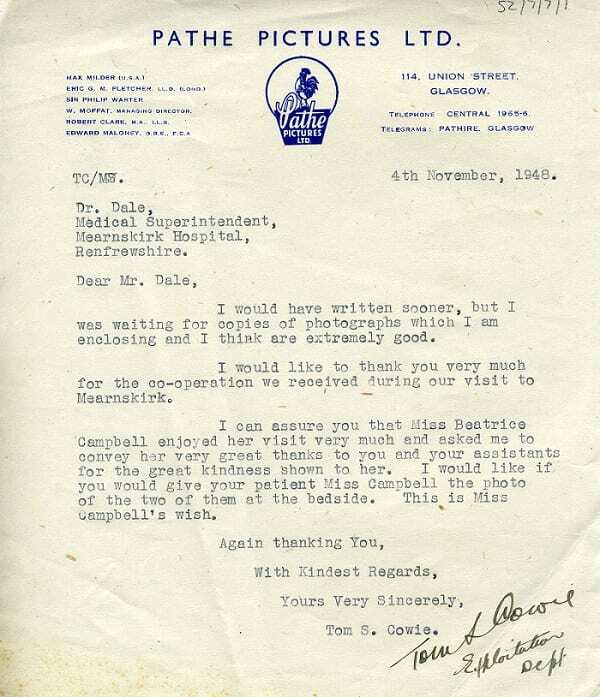 Enclosed with the letter were several photographs including one of the actress with a Miss Campbell, a patient on the ward, who Beatrice wishes the photo be given to. 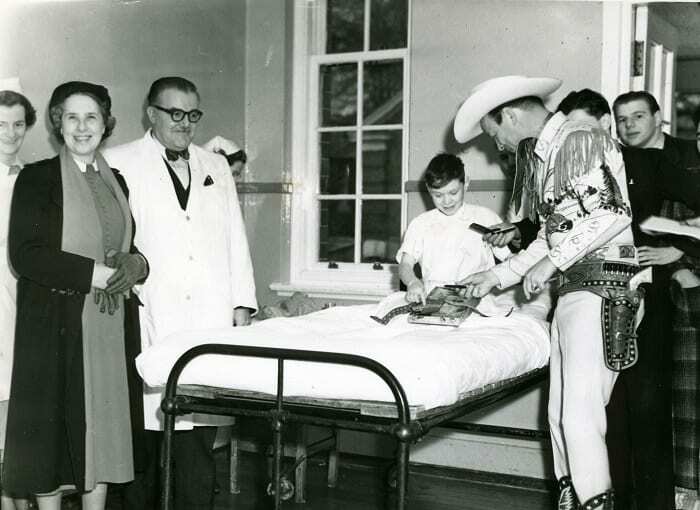 A letter sent on Beatrice Campbell’s behalf from Pathe Pictures Ltd.
One particularly exciting event for the children at Mearnskirk must have been when cowboy Roy Rogers (born Leonard Franklin Slye) and his wife, Dale Evans paid a visit to the hospital on the 9th February 1954. There are some lovely photographs of Roy Rogers handing out gifts to the children – some of whom look a little overwhelmed to meet their hero. There’s even a rumour that Trigger the horse came along but unfortunately we don’t have the photo to prove it! There were many other famous faces that graced the wards of Mearnskirk including Frankie Laine, Frankie Vaughan, Jimmy Logan and Princess Margaret. 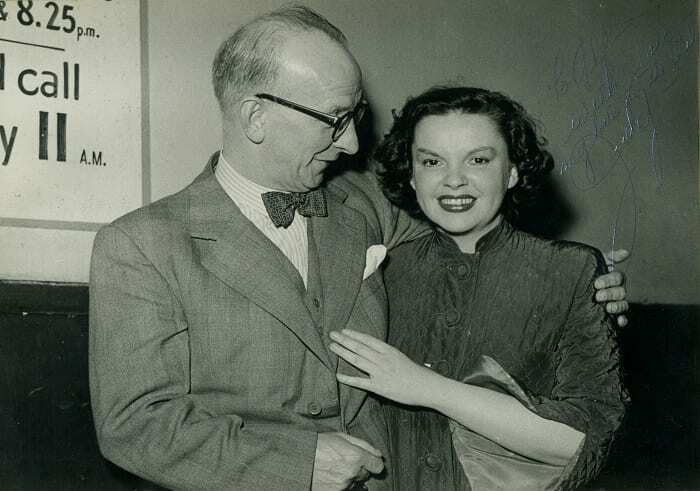 Many of the celebrity visits to the hospital were arranged by Mr Alfred Ellsworth, who was awarded an MBE for his charitable work in and around Glasgow – he is pictured here in this photograph alongside Judy Garland! You can find out more about the Dr Alexander Dale Collection on our website http://rcp.sg/Dale. 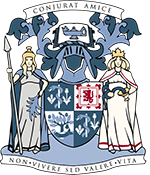 If you are interested in seeing any of the items in the collection please contact us at library@rcpsg.ac.uk.